Features more than 2,000 of the most popular and rare LEGO Minifigures! Over 256 pages of Minifigures. Engaging reference guide explores Minifigures chronologically by theme. The LEGO Minifigure Year by Year Visual History Hardcover Book shows the evolution of this classic toy for the first time ever, with exquisite photography and fascinating facts about each and every Minifigure included! Featuring more than 2,000 of the most significant, popular, and rare Minifigures, this engaging reference guide explores Minifigures chronologically by theme. Fans will learn little-known facts about their favorite Minifigures in this first-ever publishing of the evolution of the famous LEGO Minifigure! 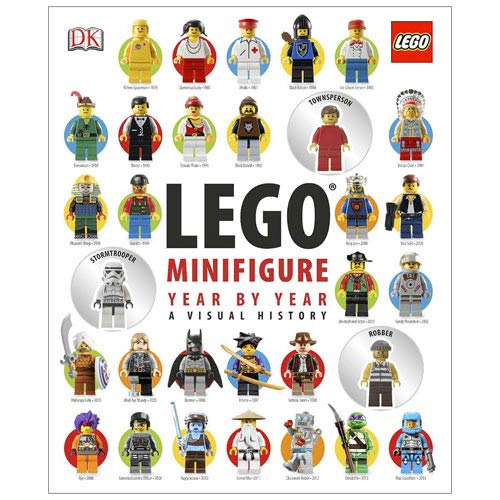 The LEGO Minifigure Year by Year Visual History Hardcover Book includes over 256 pages and is recommended for ages 6 and up.